Special Flounder Trip - Sunday, August 23rd - 6:30AM to 4PM - $125.00 - Reservations Required. Saturdays 6:30 to 3:30 - $125.00 – Sundays In August By Announcement Only - Scheduling September Sundays - Otherwise 7 to 3 at $110.00. Small-scale reef building that adds up over time; We've recently reloaded the block pile with 90 pound reef blocks. Now 11,943 Reef Blocks Deployed at numerous sites. Active presently are Doug Ake's Reef with 2,274 - St. Ann's 1,361 - Al Giles Barge 482 - Eagle Scout Reef 648 - Sue's Drifting Easy Reef 62 - Nichols' Concrete 528 - And 120 at the upside-down tank. (Yes, it's an M-60A1 that landed on it's turret. Only the treads and bottom are exposed. I'm thinking it will support the weight of many reef blocks provided we site them accurately. All Stop at 120 - will deploy more blocks here after camera inspection.) Now Elaine's Concrete - a reef we built in the mid-1990s to about 18 inches thick. After wonderful colonization, it scoured in after just 3 years. Using the old buried-in reef as a foundation, now 24 reef blocks at Elaine's.. Please Sponsor Our Larger-Scale Reef Building At http://www.ocreefs.org - Believe This: We're Nowhere Near Reef Building's True Potential. Another Big Project Come Fall. Thank You! Been pretty steady on the flounder. Some nice fishing, though sometimes with more throwbacks than we'd care for. I think it fair to say virtually every client has gone home with dinner over the last several weeks save one. The same day he goose-egged, so did I - while folks all around had fish; some with limits of fish and even forced to give away fish. targeting flounder, sea bass are few & far between. With heavy weather always a possibility this time of year, fishing could flip after a good blow. Last Sunday I could have sold tickets heavily into a gorgeous calm day. Instead, I rounded up a few hands and went on an underwater video trip to see if we could discern effects of multi-year surveys in the MD Wind Area. We also monitored some old & new artificial reef sets around the Bass Grounds. I'm concerned "the system" has shrugged-off the effects of sub-bottom profilers in this year-after-year survey situation. I'll include a single contact below that wants to hear your thoughts. What happened this year on our reefs in the MD Wind Area is much worse than any other survey effect I've ever observed - it was cumulative. I believe NOAA, BOEM & the rest of .guv agencies concerned with things marine need to understand what happened off Maryland's coast this summer. Right now BOEM, ("The Agency Is The Expert,") holds sea bass cannot hear a sub-bottom profiler & therefore no effect has occurred. A local diver, Oleg's given us several unique views of an undersea world we do not yet comprehend. The artificial reef he filmed here is about 35 years old..
NOAA, in their version of "The Agency Is The Expert" cannot decide whether building artificial reef substrates for coral colonization is good thing or not. Whatever, we'll keep throwing reef blocks off the back of the boat until they figure it out. Pic is the most dense school of sea bass we found Sunday. In a video I produced in 2008 (but is composed mostly with video shot in 2004) -- Common Mid-Atlantic Seafloor Habitats https://www.youtube.com/watch?v=n77WF9XQRJM -- The reef scene from 6:05 to the video's end is from the same reef as this pic. It's just outside what I would consider the worst of the survey's effects but still in range for some effect. Although we looked at a lot of reef, we did not observe this many sea bass on any other reef in the impacted zone. 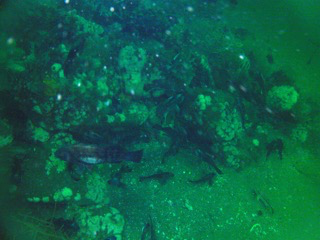 On several reefs we observed no sea bass at all including reefs that I videoed in 2004 densely packed with sea bass. We did observe cod though. Caught and released several cod these past few weeks, yet government's going to tell us sea bass are down because of global warming. I guarantee - sea bass are down because of government. They need to fix it. Amazing sea bass abundances shown in my earlier work had been known about for a very long time prior to my video. These reef-fish populations survived foreign factory trawlers, generations of sea bass/lobster trap gear and recreational partyboat effort for nearly as long ..but they could not survive computer-blind management & "harmless" surveys. If you care you should write Dr. Chu below. Anyone with ANY observation please write Kevin Chu <Kevin.Chu@noaa.gov> who is in charge of constituent engagement for NOAA's Greater Atlantic Region. If you think my observations warrant further study of sub-bottom profiler survey work - write Dr. Chu.  Major impacts would be detectable, extensive, and severe and would include a high level of physiological/anatomical damage to, mortality to, or extended, long-term displacement of, a federally managed fish species. Major impacts would also include extensive, long-term damage (quantifiable loss depending on the habitat type) to EFH, or extensive, chronic disruption of behavioral patterns (including spawning, feeding, or ontogenetic migrations) that would adversely affect a species.